As long as there is sunshine, there is energy to be harnessed. It is possible to power the world with solar energy - that was what came out as answer to a curious question posed to the speakers during the two-day International Energy Agency Task-1 meeting at Kinabalu Hyatt Regency in March 2009. RM25k is equivalent to 10 years of electricity bills of RM210 per month. Wow! no kidding, this is no doubt very expensive, but with the right approach from both the government and power utility companies (TNB/SESB), it is a viable option. Firstly, at the moment there is an incentive program by the government through PTM (Malaysia Energy Centre) called Suria 1000, whereby the government gives the public rebates of up to 75% to make it more affordable to install a BIPV system in their homes. Secondly, implementation of the Feed-in Tariffs. If such Act on Feed-in Tariffs is to be enacted, utility (e.g SESB) will pay Feed-in Tariffs to households and commercial solar service providers between 4 to 6 times their selling price. Then utility will recover this amount from the Government. Interesting, although it will still be beyond reach of the Malaysian masses; at least for the time being. Consider this: for a medium sized semi-detach or bungalow, typical power requirement is 4kW which means RM100,000 is needed to fund the BIPV systems. Minus say, 50% subsidy/bidding and you still need to pay like RM50,000 upfront for your 20 years of energy consumption. Oppssss!! 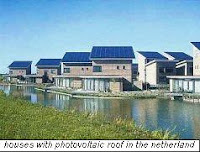 Note the 3 units of Mitsubishi Electric solar modules to "collect" power from the sun and transmit it to the inverter.